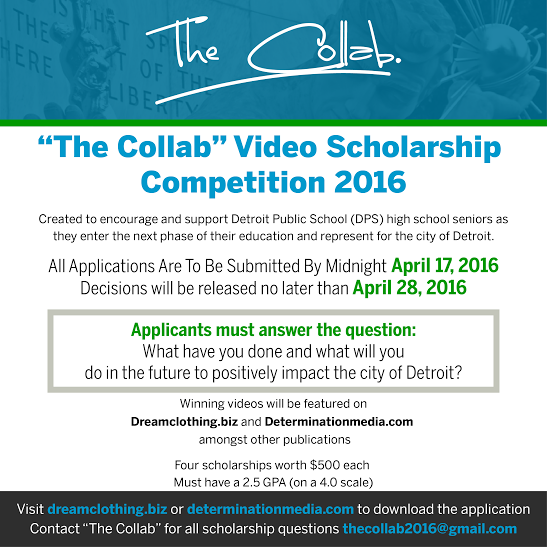 The Collab announces its Video ScholarshipCompetition for Detroit Public School (DPS) students. Four high school seniors will be selected to receive a scholarship worth $500 each. The scholarships are a result of proceeds raised from a February 13th, 2016 event called The Connection: A night of Art, Music, and Fellowship. The Collab is a conglomerate of four small businesses including Determination Media, DREAM Clothing, Bohemian Jones, and K. Welsh Designs that were started by four entrepreneurs from the city of Detroit. Students are asked to creatively answer the question “How have you helped positively impact the city of Detroit and what are your plans to continue impacting the city?” in a 5 minutes or less video. Videos are to be submitted along with a completed scholarship packet by midnight April 17th, 2016. Official scholarship application can be downloaded at dreamclothing.biz and determinationmedia.com. The "Collab" is a conglomerate of four small businesses including Determination Media, DREAM Clothing, Bohemian Jones, and K. Welsh Designs that were started by four entrepreneurs from the city of Detroit. It was created after these four businesses came together for the 2015 holiday season to host a fundraising event for Detroit based charities. Determination Media is a digital marketing and branding company specializing in web design and social media management created by Denzell Turner. DREAM Clothing is a fashion and lifestyle brand created by Caleb Moss. Delonte"Bohemian Jones" Jones is a Detroit raised DJ and musician who is encouraging art through music and education in the Metro-Detroit area. Architect Kirk Welsh started K. Welsh Designs in 2014 designing for several organizations, businesses, and non-profits.